The ingredients in this salad are in season in Britain right now. Buying food when they are in season is not only cheaper and has a great fresh taste, but it is also good for the planet, because it has not been flown over from another country. So, it’s a perfect opportunity to try this recipe and taste the flavours in their full glory, there is not much cooking involved – it’s mostly prep as most of the ingredients are raw. 1 Put the broad beans along with hot water into a saucepan and place the tenderstem broccoli in steamer above. On a high heat, bring it to a boil and cook for 7 mins. 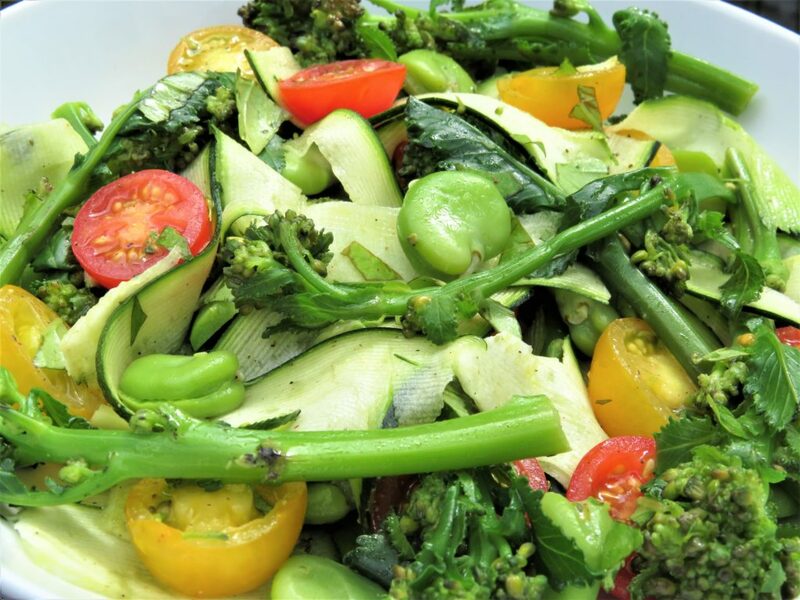 2 Once cooked remove the saucepan from the heat, drain off the hot water then place the broad beans and tenderstem into cold water and set aside (this stops the cooking process and keeps it bright green). 4 Once the broad beans have cooled, remove the white skin from the broad bean (the white skin makes it bitter) to reveal the sweet green bean inside, then add it to the bowl with the courgettes. 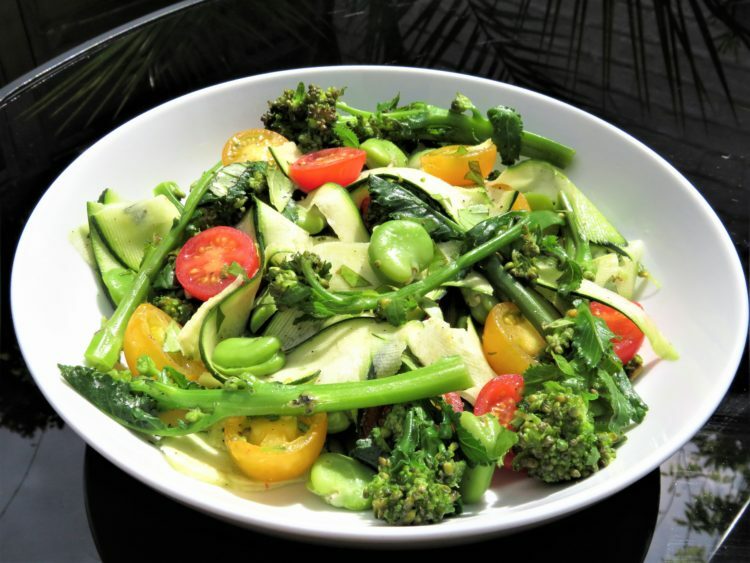 5 Then add the red and yellow tomatoes, tenderstem broccoli and basil to the bowl. 6 Put all the ingredients for the dressing in a jar with the lid on give it a shake or mix in a jug, then pour the dressing into the bowl. 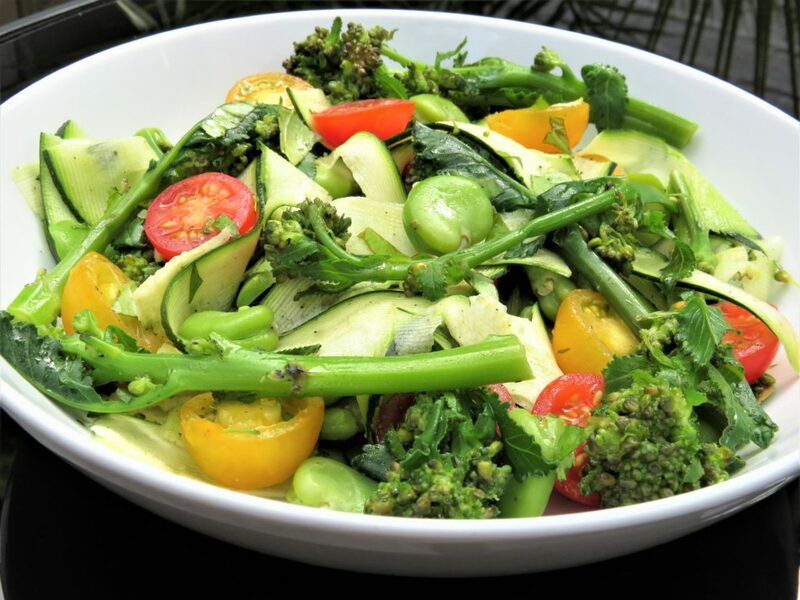 7 With your hands give the salad a toss, serve and enjoy the wonderful seasonal flavours. Yum! Courgette Contain vitamin-A, vitamin-C, iron, folic acid, zinc and are rich in dietary fibre. They can help with keeping your eyes, hair and skin healthy. Broad Beans also known as fava beans, are very high in protein and are a rich source of plant sterols which protect against breast cancer, L-dopa which is good for body movement and a healthy brain which can protect against Parkinson’s disease. They are an excellent source of dietary fibre, folates, vitamin B-6 and vitamin B-1, iron, copper, manganese, calcium, magnesium and potassium. Basil is low in calorie and has disease preventing and health promoting benefits and contains essential oils which have anti-inflammatory and anti-bacterial properties. It also contains vitamin A, vitamin K, potassium, magnesium and iron.